Thought Id start a thread about this years linebackers in the draft. Based on what a lot of sources say, it seems like the top linebackers in this years draft fit best in a 3-4. I have watched a little of Zachary Brown from UNC, who I think would fit well in a 43, but based on what I saw he doesnt seem like he would be much of an upgrade of what we have. Did notice he seems to read and react pretty well, but didnt seem to have that "linebacker movement". Seems as though he doesnt change directions very well for being only 230lbs. BUT, thats just my views. Does anyone have a favorite LB theyd like to see the Lions get? 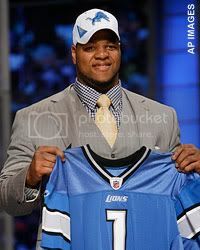 I know a lot of us were really raving about Vontaze Burfict last year, but most likely he will be gone before we pick. Personally, i can see him as a 43 backer even though a lot of sources think of him as a 34 guy. i really like kevin reddick at UNC, more than Brown. also regarding your post - I think their is room in the Lions defense for one of the LBs to be that 3-4 type of OLB, maybe a guy thats fits the prototype but is slightly smaller or a little more of a coverage player than a passrusher but one that can be effective blitzing. Levy all around is marginal IMO and I really like Durant but he isnt much when he blitzes. Hogue will end up replacing Levy once he gets the system down. He's MUCH better in coverage, and a sure tackler, so I think its just a matter of time. He doesn't lack the speed like Levy does either. If LB is BPA when we pick, then they might grab someone, but I believe we have much more pressing needs than LB, which is nice to say for once. Don't forget Durant signed for 2 years. I like Durant and he made plays all season. Tulloch was a good pickup, but we got shredded over the middle in our zone coverage. Levy was a giant liability against the run all season. When the opponent needed to get yards on the ground they almost ran exclusively Levy's way. I'm excited to see if Houge can fill that role. I'd like to see Kuechly from BC and plug him in the middle, especially if Tulloch wants a ton of money. They say Kuechly is a tackling machine, but his size (or lack thereof) kinda scares me. I kinda like having a "thumper" in the middle. Chris Spielman's size scared people too. Chicken Livers. LOL. Not saying Kuechly is Speilman. But, I ignore comments about someone being too small to play LB. By the way BillySims, I just might have to copy your signature because as of right now I very much so agree with you about Vontaze Burfict. Sure, I haven't patented the sig. While I thought Tulloch was an improvement in the middle, I wasn't overly impressed with his play. Levy definitely struggled in both run stop and coverage. Durant played well, but he also struggled at times with tackling. I can't see them upgrading the whole linebacking corp, but I would think that Levy is the odd man out for me. He would make a great back up player since he can play both the inside and outside, but I'm not sure that would be an option for us or him at the end of the day? I'd really like to see them make a huge upgrade at Levy's position. I agree. I think an upgrade can be had at any of the 3 LB positions, but Levy's weakside linebacker position needs a significant upgrade. Though some say Burfict might bring some sort of dirtyness to the team, I think at the same time he would bring an attitude to the linebacking core that the defensive line got last year. There are several LB's in the draft, but if the Lions go LB in round 1, Id have to place my vote for Burfict at this point. Yeah, if we go LB rd 1... I def. want Burfict.